This graphic plots the orbit of the near-Earth asteroid 2002 AM31 through the solar system. 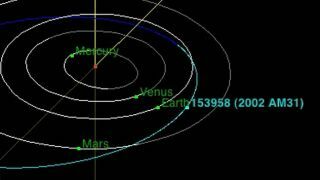 The city-block size asteroid will fly by Earth July 22, coming within 17 lunar distances to the planet. A city-block size asteroid will fly by Earth today well beyond the orbit of the moon, and you can watch it zip safely by live in an online webcast. The asteroid 2002 AM31 will make its closest approach to Earth on Sunday (July 22), when it will pass by at a range of about 3.2 million miles (5.2 million kilometers). That's about 13.7 times the distance between the Earth and the moon. On Sunday, the Slooh Space Camera sky watching website will host two live webcasts to offer Internet denizens views of the space rock from telescopes at the Prescott Observatory in Arizona and the Canary Islands, off the west coast of Africa. Asteroid 2002 AM31 has no chance of hitting Earth this weekend, scientists say, though it is on the watch list as an object that may one day pose a future concern. The space rock is listed as a "potentially hazardous asteroid" by the Minor Planet Center at Cambridge, Mass. Asteroid 2002 AM31 was discovered in 2002 and is already being tracked by radar by astronomers at NASA's deep-space radio antenna in Goldstone, Calif., and at the Arecibo observatory in Puerto Rico for its weekend flyby. A July 12 look at the asteroid by the Arecibo observatory radar suggests the asteroid is about 1,115 feet wide (340 meters), according to a Goldstone radar observation planning update. But a notice from NASA's Asteroid Watch program at the Jet Propulsion Laboratory in Pasadena, Calif., estimates that the asteroid is more than twice that size, with a diameter of about 2,600 feet (792 meters). "Near-Earth asteroid 153958 (2002 AM31) represents one of approximately 9,000 whizzing past Earth at any given moment and we wanted to highlight this one as it's only 13.7 lunar distances from Earth and well over one city block big — similar to near-Earth asteroid LZ1 which zoomed past us unexpectedly mid-June," Slooh Space Camera president Patrick Paolucci told SPACE.com. Paolucci, Slooh's Paul Cox and Astronomy Magazine's Bob Berman will provide commentary during the asteroid flyby webcast, with astronomer Matt Francis of the Prescott Observatory joining for the second session.